Dr. Joyce Kim received her Bachelor of Arts degree in Biology at the University of California at Berkeley. She then attended Pacific University in Oregon where she was awarded her Doctor of Optometry degree. Dr. Kim is a member of the American Optometrist Association. She has been dedicated to serving the Sunnyvale, Mountain View, Santa Clara, and San Jose community in her practice for over thirty five years with many long-time patients. She continues to provide the highest quality care utilizing the most modern equipment and a genuine caring attitude. Dr. Kim and her husband live in Palo Alto and have four grown children, all of whom live and work in Northern California. Dr. Elaina Chi received her bachelors degree from the University of California at Berkeley. She then attended State University of New York College of Optometry where she was awarded her Doctor of Optometry degree. Her externships included St. Albans VA Hospital in Queens, NY and the Omni Eye Center in Atlanta, Georgia. 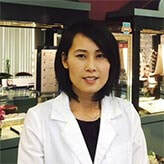 She has been practicing in Sunnyvale and San Jose for over 10 years providing the highest level of care for both vision and medical eye conditions. Dr. Chi especially enjoys fitting CRT lenses which has helped to slow down the progression of nearsightedness in many of her young patients including her own son. ​She lives in San Jose with her husband and three children. Dr. Miae Kim received her bachelors degree from Indiana University at Bloomington . She attended Indiana School of Optometry where she received her Doctor of Optometry degree. She enjoys tear-jerking movies and good novels. She lives with her husband and two active boys in Sunnyvale.